Skunk2's industry-leading Pro-C Coilovers for the BRZ/FRS feature 12-way adjustable valving, adjustable ride height, and a state-of-the-art mono-tube design. Thanks to threaded shock bodies, Pro-C Coilovers offer height adjustments independent of spring preload, which results in significant ride-height changes without sacrificing shock travel or ride comfort. Quick and precise ride-height adjustments can be made for dialing in corner balancing as well as for improved handling, responsiveness, and overall balance. Skunk2â€™s track- and street-tested Pro-C shock valving offers the perfect balance between daily driving and track performance and its all-new, shortened shock bodies and reduced shaft strokes help maintain adequate suspension travel on lowered vehicles for improved performance without sacrificing comfort. 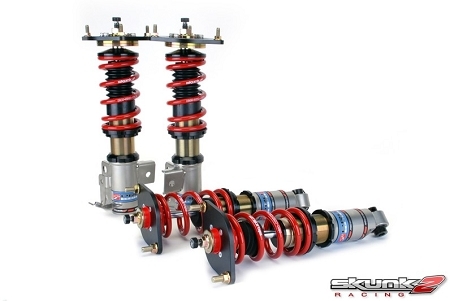 Pro-C Coilovers feature vehicle-specific, carefully selected springs designed to dramatically improve handling, and a race-inspired, mono-tube design for superior performance. Skunk2's micro-polished, mono-tube design and one-piece, forged shock bodies, combined with its precision-machined, oversized shafts and stainless steel pistons, ensure that each Pro-C Coilover is both responsive and durable. Each Pro-C Coilover also features the highest quality shock oil for consistent performance and triple upper and lower seals to ensure years of leak-free operation. The results are unmatched cornering grip, reduced body roll, and a feel of vehicle control and stability like no other. Just like the entire Pro Series lineup, Pro-C Coilovers set the benchmark for suspension performance. Similar to how Skunk2â€™s Pro Series Camshafts and Valvetrain revolutionized Honda engine performance, its fully adjustable, Pro-C Coilovers do just that for enthusiasts who are looking for high-performance suspension components at an affordable price. Based on more than 15 years of racing and suspension tuning experience, Pro-C Coilovers feature the same technology Skunk2 uses on its own championship-winning road racing and drag racing cars. Like all Skunk2 products, Pro-C Coilovers feature a one-year warranty and are designed to provide years of enjoyment for the life of your vehicle. 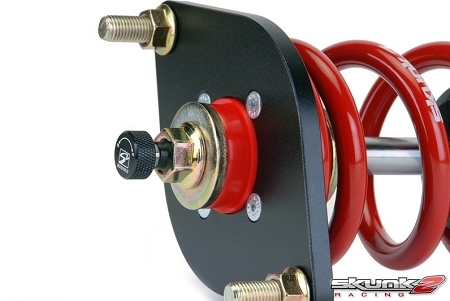 Never wait for a coilover rebuild again; Skunk2 stocks large quantities of replacement dampers that, in most cases, cost less than a typical coilover rebuild.